Most of us have participated in two of the three at some level – we play a pick-up game with friends every so often & cheer on our favorite teams on game days - but few have participated in all three. I have been fortunate enough to be all three – player, fan, and official. For many years I had the pleasure of officiating high school basketball in Kentucky. I called small games, big games, both boys and girls games, and had fun doing it all. I think the best part of officiating games is being privy to all of the behind-the-scenes action. So much happens at a fast pace, that officials have to be quick, decisive, and experienced to know how to handle more than just calling fouls and violations; more than anything, you have to know how to handle people. Players have conversations with one another, coaches are attempting to persuade officials, and at the same time officials have to communicate with the scorer's table. There is more going on in the game than anyone ever realizes, and not only is most of it interesting, but it’s often very funny! One of my favorite examples comes from what normally would be considered a boring game between a strong girls team from the eastern part of Louisville, and a weaker one located in a part of Louisville called “Okolona.” Everything went smoothly and as expected, as the strong team led throughout and the outcome of the game was never in doubt. Suddenly, with about ten seconds left in the game and the stronger eastern Louisville team leading by seventeen points, the team from Okolona calls a timeout. My partner and I were a little frustrated by the timeout being called at this point of the game because it seemed pointless. Their team had no chance of winning and we just wanted to hurry up and get home! Her comment caught me so off-guard that I just had to laugh out loud and dropped the whistle out of my mouth! All I could do was just hand her the ball and say, "Let's just get this over with, danke very much!" In addition to being verbally assaulted by a German-speaking teenager, I’ve also been repeatedly beaten during a game by a cheerleader, and chased down a hallway by a fan during halftime! 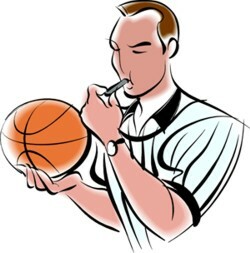 Basketball referee clip art from Microsoft Office.